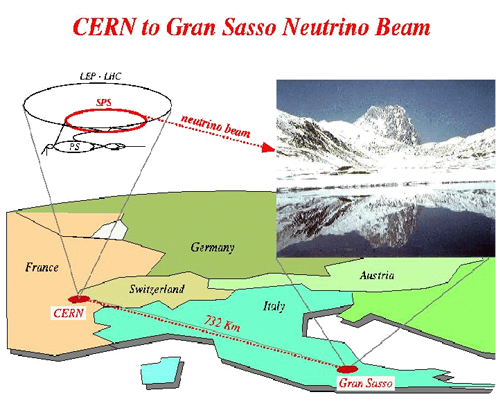 The people with the atom smashers, especially the ones at OPERA (Oscillation Project with E-tR Apparatus) in Italy’s Gran Sasso, announced to likely have a whopping 60 nano second systematic error with some neutrino experiments, but it makes for much better news to question Einstein. The scientists blame journalists for the hype, but of course they prepared everything just so that the press has no reason not to go ahead and make an Einstein spectacle out of it – the BBC promptly obliged. It is the usual ‘claim-to-be-fundamental-strategy’ as done with the God particle and all the other blown out of proportion humps-on-bumps. Note that Wired Science and SciAm for example go along with this worse than the BBC. Supposed to be the other way around? What does this tell us about science(media)? When the speed of light is involved, especially much nonsense comes shooting from all sides, not only from those with revolutionary claims, but often particularly from those who defend orthodoxy claiming that all this cannot possibly be because XYZ. Overwhelmingly, XYZ turns out to be nonsense. Plenty discuss those neutrino issues directly (I do so some more here), so I will merely give out a general warning. Most physicists are not experts on relativity, not even most of those who apply relativistic formulas daily in astronomy and particle physics. For illustration purposes, let me introduce the one-way speed of light problematic – this will give you at least one article about the speed of light today that will still be relevant after this neutrino storm is forgotten. If the speed of light is constant, is it the same in all directions? Einstein’s Theory of Special Relativity holds that there is no difference between physics as described by one reference system versus any other reference system that moves at a constant velocity relative to the first. What is wrong with this? I guess maybe 30% up to perhaps 90% of physicists reading this have by now come to the conclusion that I am an idiot, but in fact nothing is wrong with what I wrote, nothing except for that the wording is carefully crafted to irk all those who claim to understand relativity but who actually only have a superficial understanding. But don’t we all know that light velocity is the same relative to everybody and everything? Yes, if “relative to them” is interpreted as “measured/described relative to their reference system in a certain way”. But I instead focused on the actual core of special relativity, namely that I can describe physics in any so called inertial system. Oh – but it gets much worse. In fact, the cosmic microwave background (CMB) is a rather special reference system left over from the big bang: the Theory of General Relativity insists on that such a unique (!) background exists in most cosmologies (even those without a big bang). Relativity theory thus not only allows us to use any reference system (Earth, space ship, …), but it moreover suggests that the CMB may be the one to pick, say in case you desire to make contact with an perhaps underlying physics from which relativity emerges. Earth is bound to the sun which in turn is bound to the Milky Way galaxy, which moves with about 600 km per second through the cosmic reference system, that is 0.2% of the speed of light. Therefore, relativity theory suggests that light may in fact fundamentally go almost always into some direction faster than into others, certainly in all of our earth bound experiments. Relativity isn’t about the velocity of light directly, it is about whether we can ever find out about it in case our most fundamental measurement is light itself. My thumb is always exactly one thumb long. We do not just have some theory T that happens to have different interpretations, but the main point of that particular theory is that those descriptions are equally valid as far as T can tell! Such a theory gives you no indication as to which of its interpretations is more natural or closer to the truth. This property and the occurrence of such highly non-trivial dualities may be characteristic for fundamental theories. Quantum mechanics is certainly similar in this respect. Given the flood of blog articles on the speed of light these days, one aspect that can serve as a good indication for people who do not know what they are talking about is their defending a particular interpretation of relativity, regardless which one. * UPDATE: After deleting some comments, let me point out that if you think you need to explain basic undergrad special relativity to me, it means that you did not understand what I wrote, period. Before commenting nonsense, first make sure you understand what an author actually wrote (no, it is not as simple as you may think); this and this reference may also help to give you an idea about the kind of issues this text is ultimately about. No, it is not about challenging Einstein - you got it wrong.